In honor of Coffee Day, we are celebrating the stories of farmers like Blanca Rosa, who helped her community to overcome leaf rust and to create more profitable and sustainable coffee livelihoods. Blanca Rosa Álvarez studied with TechnoServe agronomists in order to train her community in good agricultural practices for coffee, planting the seeds for a new future of coffee in Guatemala after leaf rust. Even with two small children to look after, Blanca Rosa Álvarez has always found the time to care for her neighbors, too. So when leaf rust – a fungus with the potential to devastate entire coffee plantations – infested everyone’s coffee farms, she was worried that they were going to lose everything. During the first year of the leaf rust epidemic, production was close to zero in the community. She asked the government for help, but there was no response. So when an agronomist from TechnoServe paid her a visit and asked her to join a team of community trainers, she enthusiastically agreed. 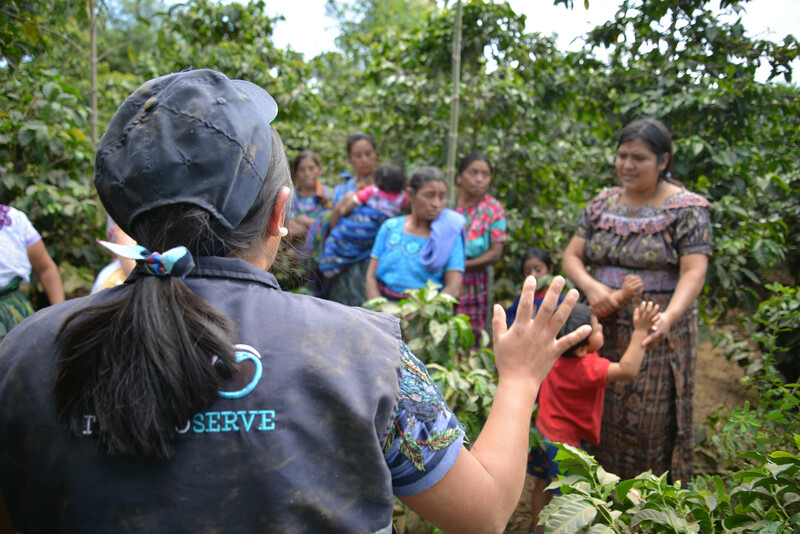 TechnoServe was hiring community trainers as part of its efforts to increase coffee production for Guatemalan smallholder farmers. The initiative launched in 2012, reaching more than 15,129 farmers – more than 12 percent of the country’s total coffee producers – by its close in 2017. The first year after leaf rust infested community coffee farms, production was close to zero. Guatemala’s small producers are particularly poorly equipped to combat the effects of climate change and the spread of crop disease. 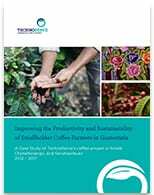 This vulnerability is due to many factors, including limited access to extension services and information about agricultural best practices, as well as reliance on two non-resistant varieties of Arabica coffee, which make up 99 percent of Guatemala’s coffee production. As a result, farmers continue to be threatened with reduced yields, lower bean quality, diminished resilience, and increased production costs. In fact, Guatemalan farmers’ yields are 60 percent lower on average than the global average. Although coffee farmers typically diversify their income by growing food crops or pursuing other economic opportunities, they derive nearly 60 percent of their earnings from coffee. But for the last 5 years, that income has come under increasing pressure: climate change, leaf rust, and pests like the borer beetle have posed major challenges for Guatemala’s coffee farmers. Overcoming these challenges of production is crucial to improving the food and economic security of Guatemala’s 120,000 smallholder coffee farmers. 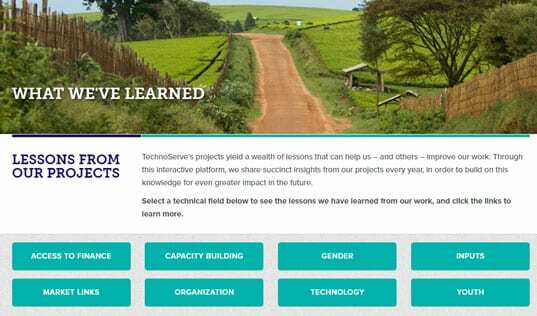 Through the project, TechnoServe sought to teach sustainable, cost-effective good agricultural practices (GAP) that could have a substantial and lasting impact on farming families. But creating real change for farmers required trainers like Blanca Rosa. In order to effectively reach as many farmers as possible in highland communities – many of which speak mostly in their local languages rather than Spanish – TechnoServe recruited a team of farmer trainers drawn from the local community and fluent in the respective Mayan language. When they came to Blanca Rosa’s community, a contact from the local government recommended her to the TechnoServe team, and she quickly began studying with project agronomists to become a farmer trainer. 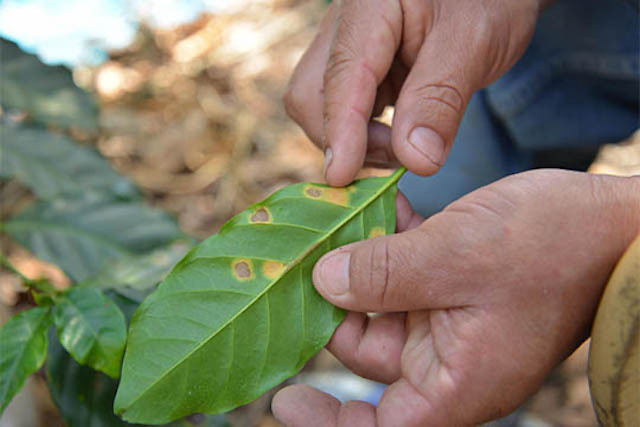 Leaf rust posed such a threat to coffee communities that women also began to attend trainings and to become active decision-makers on the farm – a practice that was not common before the outbreak. Blanca Rosa was a motivated student, driven by a desire to contribute to her community. “I needed to help, and by agreeing to be a trainer, I was gaining the knowledge to do it right. It was my dream job. I was being paid to do good,” she explained. Even though Blanca Rosa was the only woman trainer to train all-male groups of farmers, she gained their respect by being active, motivated, and knowledgeable. She studied the modules thoroughly, practiced lessons in the indigenous local language of Tzutujil, and paid close attention to the explanations that the supervising agronomist gave for all the questions the farmers could ask. “Every time I started a new subject, I did a quick oral quiz on what we had seen the previous month to make sure everyone was on board,” she said. The farmers seemed invested in her text-free, practice-based lessons. “Their participation and commitment made me happy. With all the troubles and difficulties they have, they still participated, which means that what we were teaching them was useful,” she said. Blanca was also encouraged to see that farmers would bring their own tools and share them with other participants. The farmers learned how to better manage their farms – spraying organic fungicides to fight leaf rust, setting traps for pests, and managing shade – to increase yields and incomes. “The silver lining of the leaf rust outbreak was that it created an incentive for farmers to attend training, since they did not know how to address the problem on their own. As a result, the farmers grew to have more productive and better-managed coffee plants,” she said. The results of the trainings were significant. 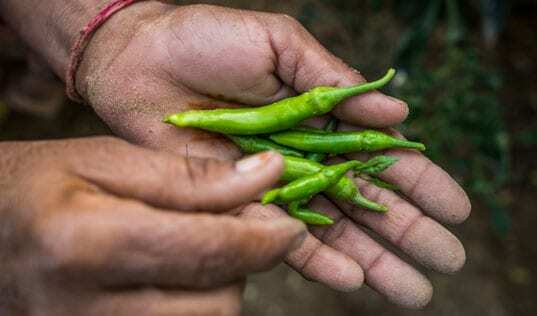 Despite changing climatic conditions and widespread leaf rust disease, participating farmers saw their yields increase by an average of 45 percent and their incomes grow by 35 percent. This has had a tangible impact on the lives of many of the farmers, allowing them to send an additional child to school, acquire more land, or re-invest in their existing landholdings. Blanca’s own life changed dramatically as a result of her work as a community trainer. With her salary, she was able to buy 6 new cuerdas (the locally used unit for land area) and plant additional coffee trees. Now she works alongside her husband to apply everything she has taught others. Once empowered as a local leader, Blanca began taking on other problems in the community. For example, she noticed that the children whom mothers brought to training were often skinny and pale, signs of critical child malnutrition in the mountain villages. Blanca reached out to an organization and asked for materials and an instructor to teach the mothers how to use nourishing vegetables and herbs, which they grew in their yards, to better feed their children. By sharing knowledge and training, Blanca is helping her community to build a better future through better coffee. Learn about TechnoServe’s work supporting coffee communities around the world, and find out “which coffee you are” in our Coffee Day Quiz.